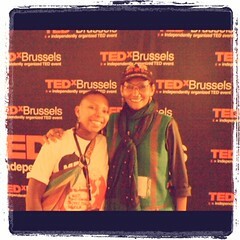 Second time I volunteered at TEDxBrussels. It’s through a combination of circumstances I found myself involved in the TEDx crew. Already fond of TED talks, I signed up for the first event at the parliament in 2009 and few days before the event, I heard that the organizers were looking actively for volunteers. At that time, it was sold out to 500 attendees with 500 more still on the waiting list. I made my choice, gave up my seat and certainly made the day to somebody unknown, and went into this exciting experience. This earned me a guaranteed free seat for the next event. So, last summer I received a reminder saying that I can book a free spot and part of the audience as promised. And once again I gave that seat but this time to my friend and rather chose to volunteer again, with no regret ! TEDx experience is all about meeting other peers, other people who believe in and want to change the world. It gives us an opportunity to contribute to something that we care so much about and naturally making new friends in the process. A terrific, amazing experience and can’t wait till the next one!! This entry was posted in Volunteering and tagged Bibi Russel, Brussels, TEDx. Bookmark the permalink.